FIXED 3/6/2018 - Had to fix the back of the shoulder, please redownload the mesh, sorry. Make sure you have the v2 version. 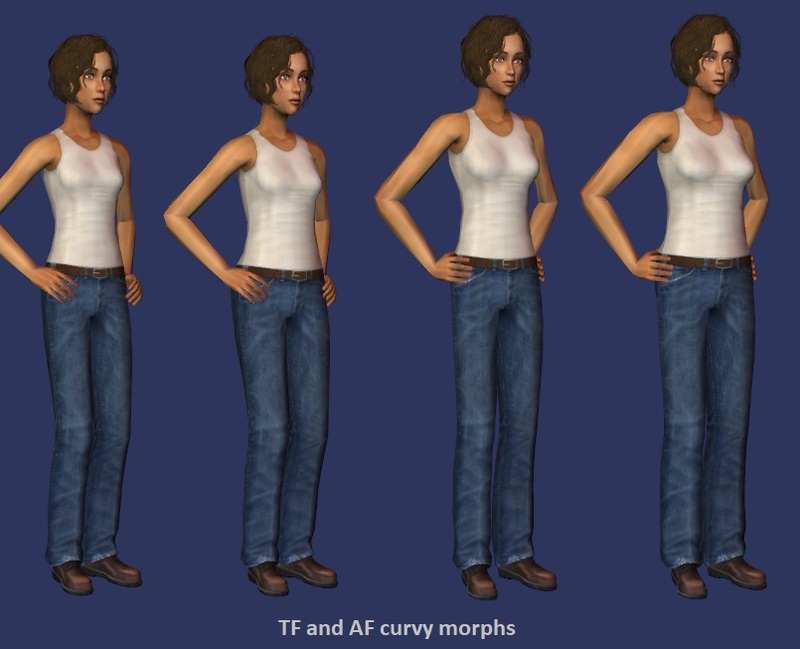 Default replacement meshes and textures for af/tfTopBlousedWaist. Adult mesh has a preg morph. There is one mesh file and three texture replacement files. 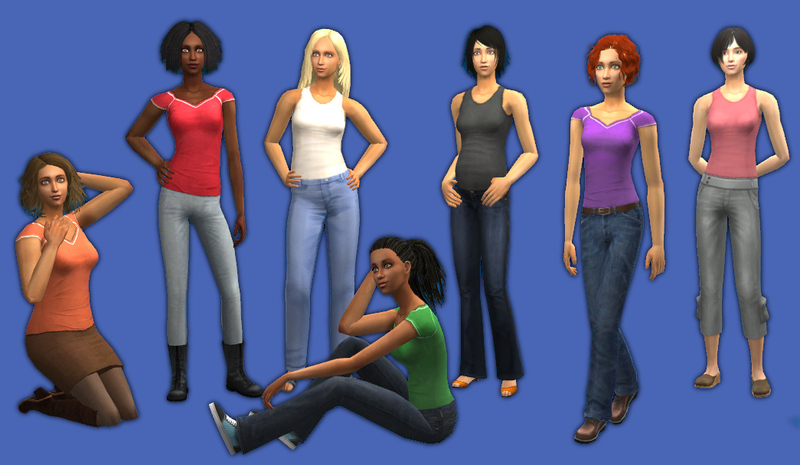 Choose ONE of Maxis untuck, lenasha/fansee, lenasha/fansee2. Lenasha/Fansee has fansee's original white/black/pink, lenasha/fansee2 has colors closer to Maxis (cream/charcoal/rose). I also found a green texture so added a lost and found green. It will be Maxis untuckable or lenasha. Conflicts with any other replacements of the same stuff. If you want all six replaced with fansee, no lenasha, Marja did that here. Credit for the beautiful textures goes to fansee and lenasha. Their shirts are not required but you surely already have them. NOTE: You may want my UPDATED 2018 preg morph for the H&M pants shown below. The readhead wears my boyfriend jeans. Lenasha/Fansee v2 Textures - You can only have ONE replacement texture file! 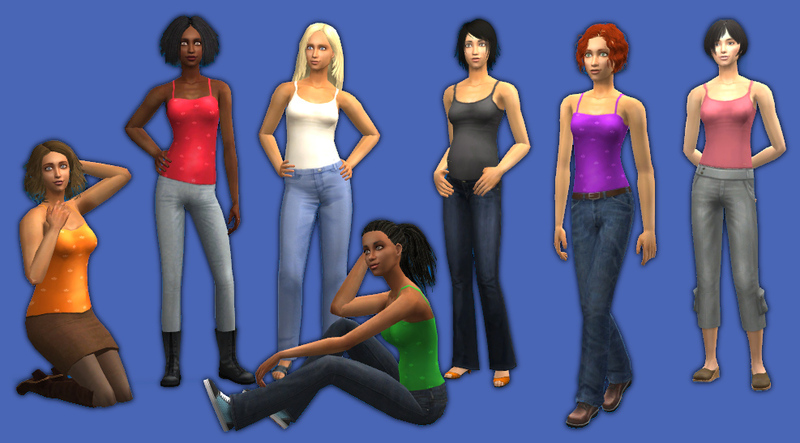 Version 1 of lenasha/fansee has pink/white/black fansee tanks, version 2 (pictured) has Maxis colors, rose/cream/charcoal. Untuckable Maxis Textures - You can only have ONE replacement texture file! How does your new mesh relate to HP's untuckable-top mesh ? @dharden - It is not the same mesh although it looks similar. The UV mapping is slightly different and the preg morph works correctly. 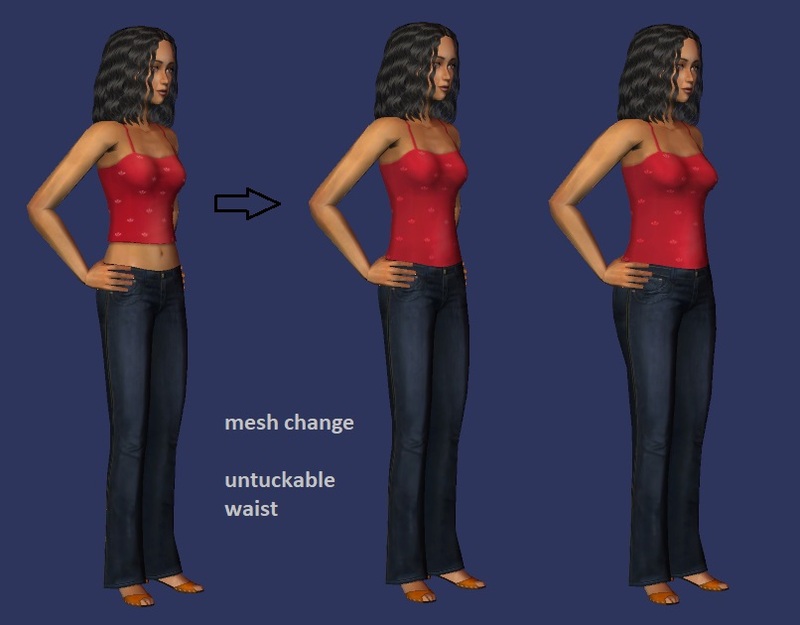 HP's original untuckable top mesh had a broken preg morph. 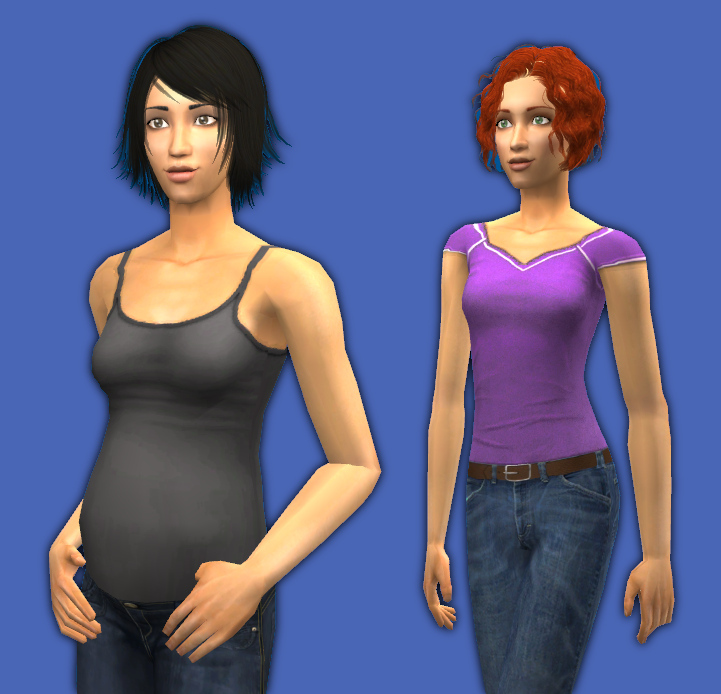 I posted a fix for the HP preg morph here. Would be fine with HP just putting the fix in her thread but she's busy. I just realized the shoulder on the back of my mesh had borked UV mapping so I fixed it. Please redownload, sorry for the inconvenience! Short answer, I wouldn't put HP textures on this mesh, the shoulders and necklines may not match up quite right. I had to edit the shoulder straps of fansee's textures a bit to get them to line up on this mesh. EA's fault, not fansee's. Wanted the mesh to work with the old Maxis straps and not break old recolors. 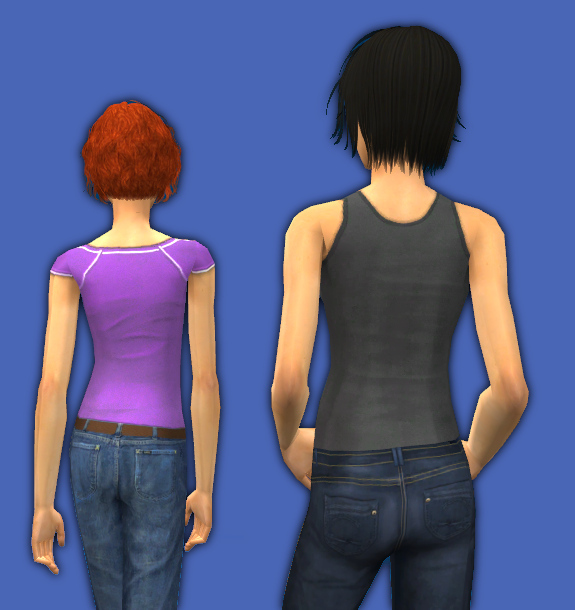 Damn EA made the uv mapping for the neck/shoulder area different on many of their tops. Some are just slightly assymetrical. It's a pain. [edit again] Had to fix the fix, sorry! Make sure you have the v2 version of the mesh file, ends in _v2.package. Last edited by CatOfEvilGenius : 6th Mar 2018 at 9:12 PM. @dharden - Were you trying to say my shirt preg morph doesn't match HP's pants? I only just noticed that. I will go back and fix all my 2018 uploads to match HP's shirts and pants preg morph! Probably tonight. I was matching to my old naked mesh which did not match HP's meshes. Will go back and fix that too. Aaaaargh. Darn non-matching stuff must match. That's what happens when I don't make cc for years, I forget stuff. The computer crash that wiped out much of my most recent work did not help. I didn't have cloud backup then. No, I was just wondering if the shirt meshes could use the same textures. I'm confused, it this fixed yet and which one do I download? It's still saying !Don't Download! I don't see anything that say v2. I'd love to download. Thanks. @mommasimplayer - Sorry for the wait. I noticed there is a slight mismatch between some of my old stuff and some new stuff and some other old stuff. It will take me several days to go and make it all match. Probably not until after spring break. Sorry for the wait! However, you can use this stuff just fine on non-pregnant sims. I used the HP default, but it does not fit all pants / skirts. Can not wait to test yours. Thanks!! !